That’s it Mart, let the clutch out and give it some….”, said my school mate, as I perched upon his Vespa scooter in their families garden and after several attempts, away I went! In no time at all, changing gear on the handlebar twist system and experiencing for the first time, the freedom, joy and excitement that only motorized two wheels can give and from that moment, I was hooked. In our teens, the bike of choice was of course, Yamahas hugely successful FS1E. As my piggy bank would not stretch to such luxuries, I was just a tad excited when one of my mates told me that his big brother was selling his moped, “£50 and its yours!” he said, “ Mind you, it does not start, but I will get it going!”. After three nights tinkering, it finally fired into life and the Gilera 50 was mine. A what? I hear you cry! 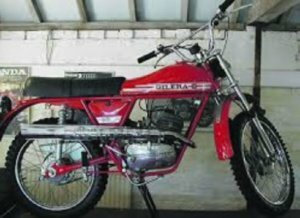 Yes, It must have been one of the only Gilera mopeds in the country as no bugger would be daft enough to buy one! But who cares, it was mine…. The electrics never did quite get sorted as often, it would blow the front headlight, which made for some interesting rides home, from Stourbridge and Kinver at night! 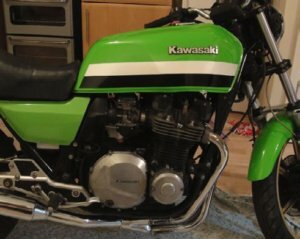 Some of my mates progressed on to Suzuki X7’s, RD250’s, Superdreams but in particular, went straight to a beautiful, green, Z650. Later progressing to the KH750 triple, a sight and a smell of two stroke to behold. Suffice to say, he looped out the beast one two many times! 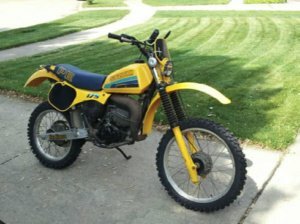 As for your truly, I started work as an engineer and brought my first off-roader, a PE175 Suzuki as a group of us enjoyed the thrill of enduros and motocross. In my early twenties (Clearly not long ago!) I turned my hand to four wheels, as I always fancied racing driving. I subsequently saved every penny I earned and joined the BRDC Silverstone Racing Drivers Club. The Club provided tuition and the opportunity to race saloon cars in the form of Montego turbo’s (!) and single seater Formula Ford (FF1600). This was fantastic fun and a great experience. As Club members, we could use the Club House any day, which included the British GP’s, albeit, we were confined to the Club House, but that was right on the circuit, a fantastic spot to spectate. After time it became apparent that ‘Money talks’ in racing and unless you have very rich parents/parents willing to dedicate their whole lives to your racing dream, you are never going to make it! At this stage, I had progressed into the chemical industry with a company specialising in industrial products, eventually sitting on the main Board as Sales and Marketing Director. Back to bikes….. 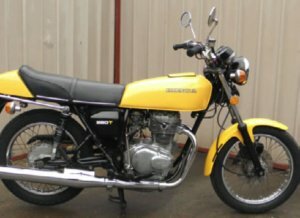 It so happened around the time of my move to the chemical industry, my uncle was leaving to work in Saudi so I brought his YELLOW Honda CJ250J. Not the prettiest of bikes but somewhat more reliable then the Gilera and great fun. This was followed some years later by a red and gold (!) Kawasaki Z1000J. I spent a long winter in the workshop converting this to a green, black and white Eddie Lawson replica, a wonderful bike…… Happy days indeed. This was followed by a fabulous GXR 750. 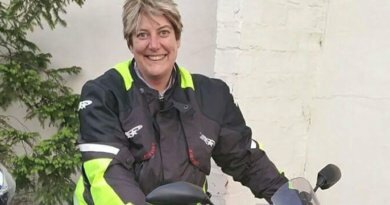 Cars, girlfriends, work, marriage, house, life in general, put my biking days on hold, until one fateful day (This is a story in its own right!) brought me and my beloved Kawasaki ZX750R together. 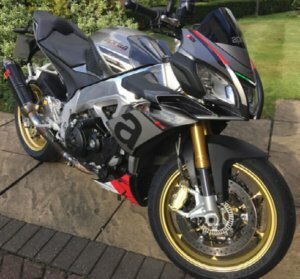 A homologation special, which was basically a race bike with lights and number plate! Around this time a mate of mine in the West Mids constabulary suggested I do a Bike Safe Course before I killed myself. Clearly, he did not understand what a ‘Riding God’ I was! Bike Safe made me realize the contrary and that I was lucky to have survived this long and the journey with BAM began. The Zed had to go, which was followed by a SV1000S which in later years, I found to have belonged to another BAM member who had used and abused said SV! (Another story there eh Steve!). During this period I also had an SV650 track bike, which had a wrestling match at the California Superbike School! (Story in a previous BAM Mag). My career was now taking a different turn as our company was involved in acquisitions across Europe, restructuring and eventually was sold to an American private equity company. It was at this stage I decided to set up my own chemical company. The SV was followed by the next three generations of Fireblade and as we all know, they are a truly wonderful bike, little wonder then that Cus has always longed for one! Around this time I fancied experiencing bike racing and brought Flippers CBR600 Steelie, which I raced in Thundersport Streefighter class. A truly eye opening and exhilarating experience! The current steed is the mighty TUONO V4 1100 (Another previous mag!) And the ZZR1400 was swapped this year for an S1000 XR which we used for the Scottish Tour 18, a terrific bike. 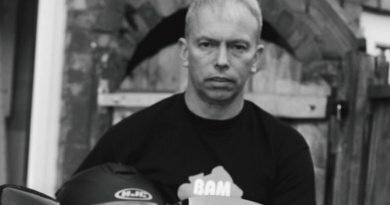 I have been involved with BAM over many years and enjoyed immensely my time on the Committee and helping Cus run the Training Team. So now in between my Examining duties, I also conduct Masters Mentoring for various Groups. One of the IAM best products is their Skills Days, which I am actively involved with managing the instructors and organizing training. These are fantastic events and if you have not been on one, you should! We have booked four days at Mallory next year, three bike and one car, details of which will be published in due course. 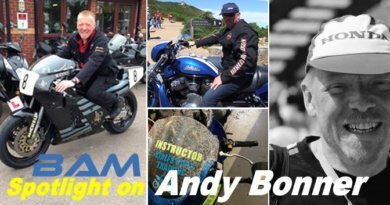 This year has been a busy biking year for me, unfortunately, not too many BAM days, however, as the big man said “I’ll be back!”……..